L.A. Amnesia is a potent, high yield sativa with a revived up THC count, the result of a collaboration between the legendary growers of Paradise Seeds and legendary cannabist, Tommy Chong for his new company Chong’s Choice. L.A. 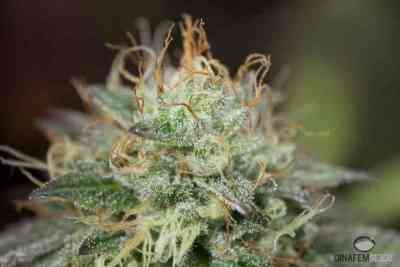 Amnesia combines the genetics of the world famous Dutch strain, Amnesia Haze, with a highly potent Kush variety. Named after Los Angeles, this heavenly strain is a perfect match for the City of Angels! Amnesia is a fruity energetic strain, with a genetic code that has its roots in Jamaica and South Asia, and needs little introduction for experienced cannabis heads. Meanwhile, the Kush in this combination is Paradise Seeds’ own twist on the popular variety, carrying Dutch genes that give this classic a real turbo boost. For an indoor grow room, L.A. Amnesia is a great choice and is a good plant for beginners as well as old pros. Although it is a sativa, the Kush element ensures it does not stretch so much as other varieties and the plant produces thick central colas with very big buds and a high calyx-to-leaf ratio. The trichome coating is so heavy that these buds sparkle like magic crystals. In an outdoor setup, L.A. Amnesia will also do well. In southern regions where there is ample warmth and light, it will respond by shooting for the sun and will reward the grower with a big bud harvest. It will also grow reasonably in more northern regions of Eurasia and the Americas, although the dense oversized buds do need checking for mold in Autumn. With this strain, the grower is treated to the best of both worlds. It has a distinctive citrus/earthy/hazey taste, full of terpenes that will be popular with the connoisseur, while the extraordinary power will impress those who relish a smoke that hits home hard. With a 20-24% THC count, potency is the name of the game, and this plant comes with an intense high that will energize the head and impound the body! L.A. Amnesia will enthuse recreational sativa aficionados and its all round qualities will bring pain relief and stimulate appetite for medical users.